This cylindrical cartilaginous “bone” is the force behind the shark. Thousands of years ago indigenous people used them as adornment and thousands of years later, they continue as adornment. 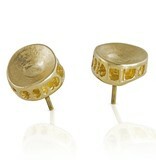 Lost wax cast in 14k, sterling silver, and available in vermeil. Very popular as earrings or stunning as a necklace combined with semi-precious stones.